Alphabet Island Phonics is the most thorough, effective, and creative phonics and spelling program available. Its strength lies in the fact that your students learn to REASON out the spelling of words and can account for every letter used. Alphabet Island Phonics gives your students what they need to be competent readers and exceptional spellers. Most importantly, Alphabet Island Phonics instills an absolute love and enjoyment of reading and spelling. 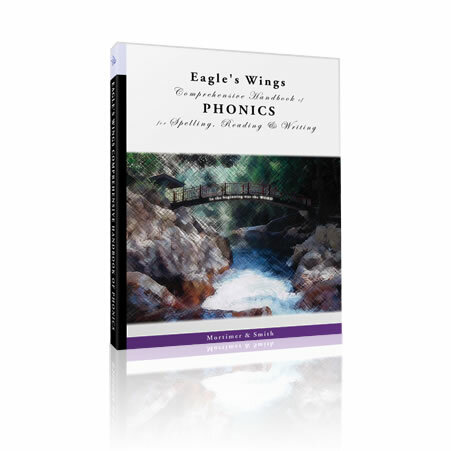 Includes the Eagle’s Wings Comprehensive Handbook of Phonics and Kinder-Math (ebooks). Alphabet Island Phonics Complete includes Alphabet Island Phonics Level 1 (Kindergarten), Level 2 (1st to 3rd grade) and the Eagle’s Wings Comprehensive Handbook of Phonics, which covers spelling for 4-9th grade. Besides giving your student a solid foundation in phonics, Alphabet Island Phonics instills an absolute love and enjoyment of reading and spelling. Also includes FREE Kinder-Math ebooks. It is finally time! Your child is ready to learn to read and write. If you’re experienced or brand new to teaching, here is the perfect program for you! 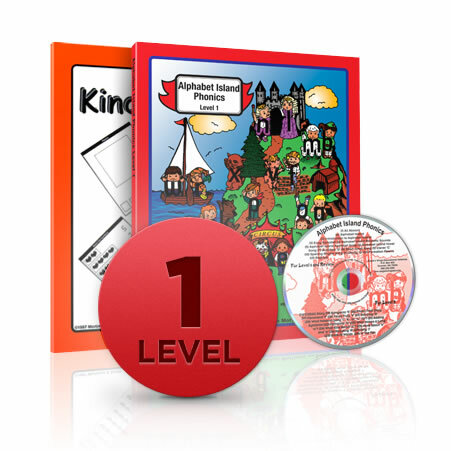 Alphabet Island Phonics 1 comes complete with step-by-step teacher’s manual, student workbook, flash cards, games, and an album of songs on CD. Beginning readers master the phonetic sounds, alphabetic sequence, correct letter formation and the reading and spelling of more than 230 3-letter short-vowel words. Formation poems teach proper direction, formation and placement of letters. Professionally recorded album of songs teaches phonics sounds, stories, poems, and original songs. Alphabetizing and reviewing the letter sounds is easy in a game form. Workbook pages reinforce each lesson. NO TEACHING EXPERIENCE NECESSARY. Read aloud lessons are designed for the first time teacher. Students anticipate rather than dread new rules. For the next rule is the next story on Alphabet Island. The daily spelling words change only one letter at a time. This allows practice with a large number of words in a short time. 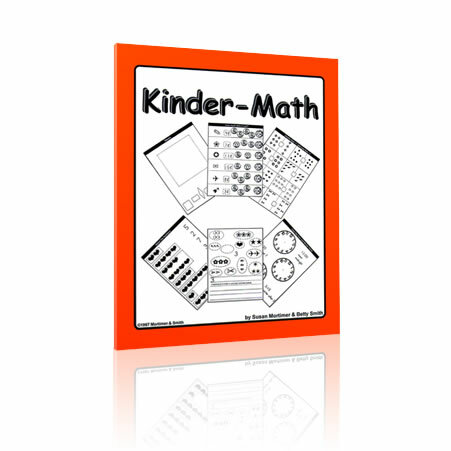 The inderinder-Math rounds out your Kindergarten program, providing a solid foundation in math. Alphabet Island Phonics 2 (Advanced) takes your child from short vowels into fluent reading. Even if your child has not been through Alphabet Island Phonics 1, if he can spell three-letter short-vowel words, he is ready for Alphabet Island Phonics 2. In two workbooks, your student will learn to spell over four thousand words with consonant blends, digraphs, silent ‘e’, doubled consonants, short vowels, long vowels, diphthongs and all other vowel combinations. You will continue on through 3rd grade with the in-depth support helps. The Alphabet Island characters make rules easy to remember. For example, few people can explain the two sounds of ‘c’. With Alphabet Island you learn it the first time around and remember it for life.Vowels are divided into two groups—’boys’ (‘a’, ‘o’ and ‘u’) , and ‘girls’ (‘e’, ‘i’ and ‘y’). Clever ‘C’ says /s/, “city”, when in front of the “girls” (‘e’, ‘i’, ‘y’) and /k/, “cat”, elsewhere. That makes the workbook page easy—color the boy vowels blue, the girls pink and write in the sound ‘C’ makes. Spelling rules, often in the form of songs, give a concise and logical understanding of when and where to use a particular spelling for any given sound. This four-line poem covers all the options for the spelling of a long ‘i’. What makes a long ‘i’? A spelling rule can be viewed as a “road map.” Each aspect of the rule is studied in great detail, making sure the child can understand, hear and work with the rule. Letter cards and workbook pages reinforce the lesson and are followed by spelling lists designed for each child to succeed. With this unique approach of knowing the rule and the exceptions, your child masters the spelling of hundreds of words at a time instead of the common practice of having to memorize 20-30 words a week. Where there are only a few words with a unique pattern, such as the sixteen common words with ‘igh’, they are introduced at one time with a picture and poem. This is the most comprehensive phonics book on the market and will allow almost anyone to become a phonics expert. For example, the revolutionary and exhaustive research done exclusively for this program shows that although there are seven different pronunciations for ‘ough’ and ‘augh’, there are only thirty common words with these spellings. They can be easily learned as a unit with our picture and poem. Phonics is the study of sounds and the whole purpose of teaching phonics is to enable your child be an excellent reader and writer. From his first story on, the Creative Writing section gives practical ways for you to help your student express his thoughts in well-written form. Each chart is a complete, computer-checked list of words with a specific pattern, and includes all the exceptions. This enables you to visualize the whole picture at a glance and to see that the description of the pattern (i.e. the ‘rule’) applies to the majority of the words in the chart. 86 Word Charts—explain how the English language works! Teacher’s Manual—clear directions on how to teach spelling and reading from each chart as well as helps for remedial and “English as a second language” (ESL) students. Q: How is spelling taught in Alphabet Island Phonics? Rules, often in the form of songs, give a concise and logical understanding of when and where to use a particular spelling for any given sound. Q: How do I know if my child does not need to start with the Level 1 portion? If your child knows how to hear, see, say and write each letter of the alphabet, and can read and spell any three-letter word, he may enter directly to Level 2. The first unit of Level 2 is review, so if there are any deficiencies, you may work on them at that time and go on into the next unit when your child is ready. Q: Why do you have the little characters in Alphabet Island? Children generally do not develop in their abstract thinking skills until they are about 9 years old. Spelling is actually a very abstract concept. The letter characters and the stories about them make it easier for the children to understand. For example, they may not be able to remember that ‘c’ says /s/ with ‘e’, ‘I’ and ‘y’, but they can easily remember that Clever ‘C’ says /s/ with the girls in Alphabet Island, ‘Everloving ‘E’, Innocent ‘I’ and Yours Truly ‘Y’. Q: How far does the Alphabet Island go? Alphabet Island Level 1 is basically for Kindergarten. There are two workbooks, 2-A and 2-B in Level 2 that cover 1st through 3rd grade material and the “big” patterns of phonics. When you finish with the Alphabet Island, you may continue teaching spelling with the Eagle’s Wings Comprehensive Handbook of Phonics for 4th through 9th grade. You will have covered about 40 of the 83 charts in that book when you finished Alphabet Island Level 2. Q: How long does it take to prepare for a lesson? Alphabet Island was designed to be taught by non-professional teachers, The lessons are meant to be read aloud and there is virtually no advance preparation required. It may take a little while when you are first getting started to get used to the directions, but it soon becomes easy and enjoyable for both you and your child. 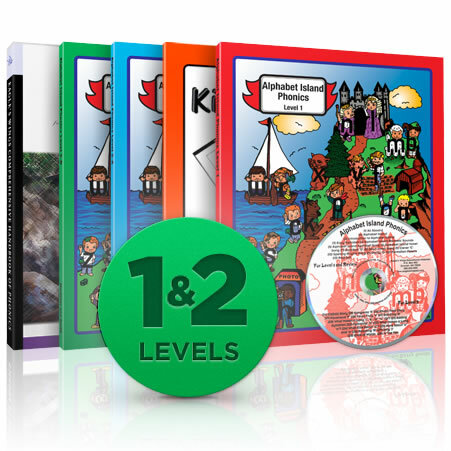 Be the first to review “Alphabet Island Phonics Complete (K-9th Grades)” Click here to cancel reply.